I get a little dizzy thinking back to how good these simple little toasts were. I mean, they're just cheese on cheese on sauce on toast, but they are much, much more. They're heavenly. I first had these at the Chef's Academy cooking demo . I liked them so much, I had to recreate a version of my own. Chefs Leo Goodloe and Suzanne Winn made a killer sauce from scratch, and I went with some from a jar, but it didn't matter. The goat cheese and taleggio really make this. I mean, seriously, how amazing is cheese? These toasts are a great appetizer for a party or a delicious snack for yourself. Heat oven to 375. Place baguette slices on a baking sheet and bake until lightly toasted, 8 to 10 minutes. In a bowl, combine goat cheese and olive oil. 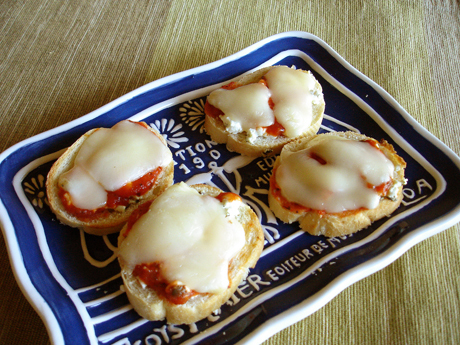 Top each crostini slice with a dollop of tomato sauce and goat cheese.